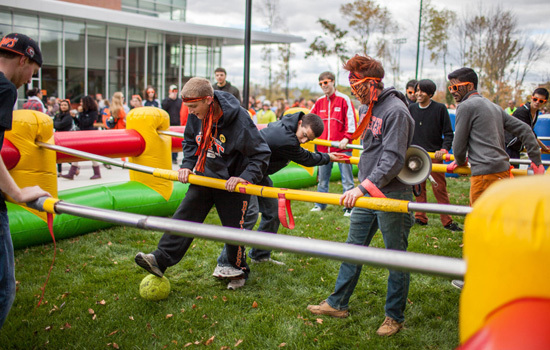 Students play human foosball during the inaugural One SpiRIT: Global Hockey Festival on Oct. 11 outside the Gene Polisseni Center. The festival attracted more than 1,600 Tiger fans. The event linked RIT’s main campus with its international campuses in Croatia, Dubai and Kosovo via Cisco Telepresence videoconferencing technology, allowing RIT students around the world to interact with each other. Additionally, festival-goers were treated to an assortment of carnival games, live music, food, T-shirts and more.